Ok, no projects to show tonight, Just some really cool Blog candy! Creating with Chrissy has hit over 80,000 hits. If you have never been to Creating with Chrissy before, Once you go there, You will understand why she has ahd so many hits, Not to mention, she has some cool challenges over there and she is just the sweetest! Go on over and check it out, You will be glad that you did! Hello all, Well, once again, it has been a while since I have posted. I think I have lost my mojo. I sit here for hours and get nothing done. I have a crop to go to on Friday night and I am afraid that I will get nothing done. I so want to get somewhat caught up on my scrapbooking. I can look at magazines for hours and have all of these wonderful ideas but when you put the paper in front of me, I go blank. I will let you all know how I do on Friday night and what ever I put together I will post it on here. So, with that being said, Here are 2 more valentines day cards that I put together. Is this image adorable or what? The only problem is, I dont know what the name of it is. I just love it though! 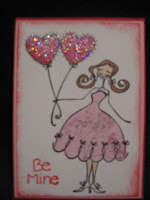 I am on a mission to make 30 Valentines cards to send out and right now I am at 15 or so. Half way there. Good evening all. Here is a a challenge that I completed for the Bella SCS Challenges.Click on the link and there you will find the Bella challenges. Soooo much fun! Color challenges, Sketch challenges, etc. The challenge was to use Ballet Blue,Brocade Blue and Lovely Lilac. I didn't think I would like just those colors together with no pinks or reds but I think it turned out really cute. I used Oh So Pretty Bella and colored her clothes in with my watercolor pencils and my gel metallic pen for the stool and around the mirror. I filled in the mirror with crystal effects and Dazzling diamonds glitter. I wanted to give it the mirror/glass effect. I also used my Embossing folder in D'vine Swirls on the lovely lilac and for the first time I used my Nestabilities in the scallop Rectangle. For other entries into the challenge you can go HERE! Happy Stampin! Some cool Blog candy from Kim! Hello all, Just a quick not to let you all know to go on over and visit Kim's blog. She is offering up some pretty tasty candy. While you are there, check out her creations. So much fun! Hello all, I hope everyone is staying nice and warm in there craft rooms! I know I am and I also enjoying American Idol. I couldnt wait for this season to begin. Congrats Cheri, Now just email me your address and I will ship your Candy right out to you! I want to send out a huge Thank you to everyone that took the time to leave me a comment You are all so sweet! Keep coming back as I will be offering up some more candy real soon! Great big hugs to you all! Well here is a card that I made for a sketch challenge and cannot remember where the sketch chal. is so, I thought I would post it anyways. I really like this card. I used some double sided paper that I bought just because I have a really bad paper addiction and thought that I might as well use it. It is from My minds eye and the colors are vary bright but really pretty. 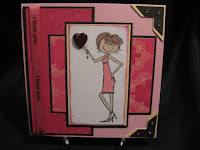 I used Daisybella from Stamping Bella, I received this image in a swap with another stamper. I colored the flower in with my Pentel Metallic Gel pen. Those gel pens write so smooth, I love em! Too bad I cant find them anywhere. I then pierced around he petals of the flower and down the stem. Isn't it adorable? I used a sentiment from Friendship Blooms from Stampin Up! Really fun card to make! Hello all, I hope everyone had a great weekend and is ready for the work week. I had to get a couple more Valentines in before the weekend was over and here they are! The one with the scallop circles I used my Nestabilities. I just bought these and they are the coolest! The colors I used were basic black, real red, and whisper white. You cant tell too much in the photo but I added some bling to the corners of the black card stock. The paper with the hearts on it I picked up at Michael's. 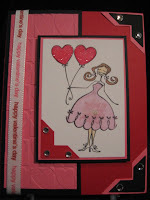 On the next card, I used my Balloonabella from Stamping Bella. I paper pieced her dress and added crystal effects to the balloons and added glitter from MarthaStewart. 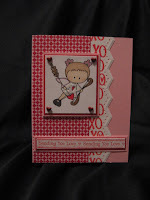 I also added bling to the photo corners and topped it off with some Happy Valentines day ribbon by American crafts. These are 2 of many more that I will be making!Enjoy and everyone have a happy Monday! Some sites for some Candy! Happy Saturday everyone. 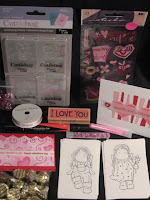 I have been doing some blog hoppin and checkin out some sites that are offering some Blog candy! I just love it when other blogs have current lists of candy out there in Blog world so I thought I would do that tonight! 6. Tasha-http://tashasdesignworld.blogspot.com/ - Jan. 19th. It's time for some Candy!!! Happy Friday my friends! What a crazy week. After having 2 weeks off for Winter break I am pooped. I have so neglected all of my Blogger friends so I am offering some really sweet candy to make it up to you all! 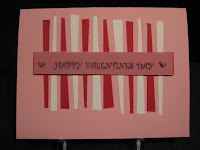 As you may know, Valentines day is my favorite holiday, I love the pinks and reds and hearts and just well,all of it. The candy I am offering to you is totally Valentines! This is what you get. 2 vials of valentine glitter, 1 pink and 1 heart confetti type. 1 roll of american crafts ribbon in white with "Be Mine" printed on it. Valentines card for my sweetie! Finally, I am able to post. I have been trying all day and error, error, error. Ok, with that being said, Here is a card that I made for My awesome boyfriend Craig. I am so bad at giving him cards. I know, I make them for everyone else and he gets totally neglected. So, I have been keeping this one on the down low. You see, I share the craft room with him, He has half the room for his train layout and his antique cap gun collection and I have the other half for all of my goodies(and I get the closet too!) so it is really hard for me to make things for him since he is usually sitting right behind me so I was being sneaky and completed this for him. Whats really cool is he totally appreciates anything that I do make for him so that makes me feel good. Vday card for my man! Well as I have said before, Valentines Day is my most favorite Holiday! I start earlier on my V-day cards than I do on my Christmas cards. These are some that I made with total scraps. I printed on the velum and used brads to attach, some I think I used heart eyelets. They are pretty simple but I totally love em! Enjoy! More tomorrow! Hugs to you all!